Facebook is the home of family photos, lighthearted chat -- and serious brand-building by automakers. Take Ford Motor Co. Ford launched its redesigned 2011 Explorer crossover on Facebook in 2010 instead of at a traditional auto show, in part to engage Facebook's huge audience. Ford also created a smartphone app for the 2013 Mustang that enables viewers to configure virtual cars and share them with Facebook friends. For automakers, it's all about creating and engaging a community of consumers with contests, photos, video and other activities. The goal is not immediate sales. Rather, it's about feeling good about a brand and its vehicles. Fiat has more than 500,000 "likes" among Facebook users. Fiat is offering $500 coupons for its 500 subcompact to those users, says Casey Hurbis, head of Fiat brand advertising and communications. As part of the campaign, Fiat also is giving away 10 cars. Duncan Scarry, CEO of Haystak Digital Marketing, an auto marketing company, says: "Facebook is the most visited site on the Internet. It is a natural place for the OEMs to promote customer interaction with their brands." Scarry said that won't change because of General Motors' decision last week to pull its $10 million in annual Facebook paid advertising. That includes ad buttons on the right-hand side of Facebook pages and sponsored stories on various topics. 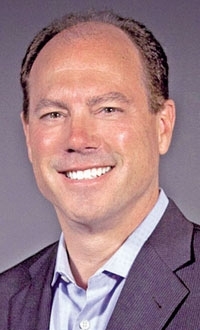 Ford is a firm believer in the power of Facebook and other social media Web sites. For the July 2010 launch of the redesigned Ford Explorer on Facebook, Ford "strategically combined paid media with the content we were creating with our own media, and we did it within Facebook and outside," Ford spokesman Scott Monty says. "Because of all those efforts working together, it had a greater impact than a Super Bowl ad" -- 400 million impressions in all, Monty says. An impression is when an ad is viewed once by a visitor. Ford's relationship with Facebook started in 2008 when a fan created a Ford page. There are now 70 Ford-related Facebook pages globally with 10.2 million fans, Monty says. "Facebook has told us that about 60 percent of them are Ford owners. So we're speaking to a very loyal and engaged group of people who really want to hear from us," Monty says. Ford spends 25 percent of its marketing budget on social media, including Facebook and other sites, he says. He declined to give a dollar figure. Ford engineers travel regularly to Silicon Valley to talk with Facebook staff members. Last fall Facebook invited Ford engineers to a "hackathon." "The way Facebook defines a hackathon is taking a bunch of existing platforms, taking the code and marrying it to Facebook code and figuring out how you make a more social car," Monty says. Among the five applications that came out of the session is one that could enable customers to stream music into their vehicles through spotify.com, a music-sharing site. The app is still at the prototype stage. 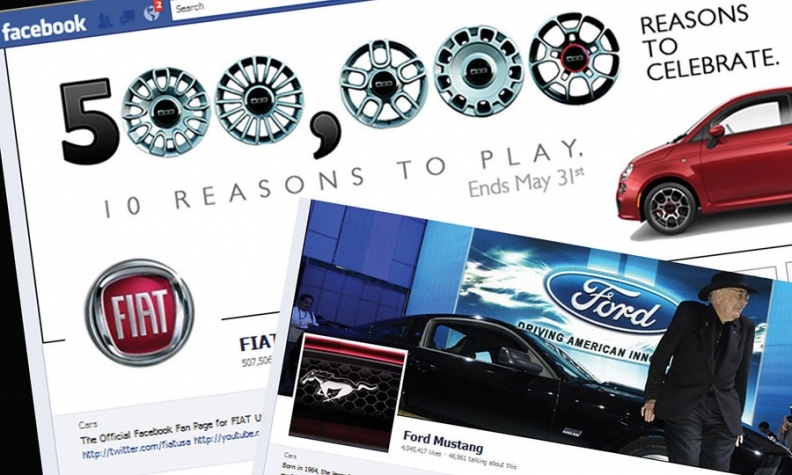 Fiat has been using Facebook and other social media in a variety of ways since before the brand was relaunched in the United States in March 2011. "We utilize social media platforms quite a bit to test out advertising, to get feedback on product and marketing," Hurbis says. "It's an opportunity to receive feedback" on consumers' feelings about the Fiat 500. The brand's "Seduction" Super Bowl commercial, for example, appeared online several weeks before the game and received hundreds of thousands of views before it was broadcast. Its commercial with Charlie Sheen, called "House Arrest," was response-tested with social media audiences before it appeared on TV. Last week Fiat began an exercise that promises, for the first time, to measure just how effective social media are at driving sales. After reaching 500,000 "likes" on Facebook, Fiat USA announced it would allow any of those half-million Facebook users to print out a $500 loyalty incentive for the purchase of a new Fiat 500. It also began a contest in which each of those half-million Facebook users and anyone who subsequently signed up to "like" the Fiat USA Facebook page could print out a unique six-digit code and take it to a Fiat Studio to see whether he or she had won one of 10 new Fiat 500s. "This will be a great first test" of return on investment in Fiat's Facebook presence, Hurbis says. "This will give us a discernable" return-on-investment "based on how many customers register and how many come in" with either the loyalty bonus or the contest entry. Honda has had some notable successes on Facebook. Its fan page for "Million Mile Joe" -- a loyal Honda owner -- attracted 500,000 "like" ratings from followers and received national media coverage, and "interaction with the Honda brand was at an all-time high," says Mike Accavitti, American Honda Motor Co.'s chief marketing officer. That campaign required Honda to pay Facebook for placement. By contrast, a press release about Honda giving a loyal customer a new car wouldn't have attracted much attention. Says Accavitti : "We all aspire to go viral." NET WORTH: Can Facebook sell cars?